With grilling, much like anything in life, sometimes less is more. So often everyone is looking for the next big thing. How do we make something "better?" How do we "take it up a notch?" How do we "elevate our game?" Here's a crazy idea, how about we concentrate on the basics? How about we savor simplicity? This is something I've encountered in over two decades of my profession and appropriately enough, the same span of time with my grills. If I have to consult a recipe to pull off a convoluted meal I'm adapting for the grill, that's understandable. If I have to consult a recipe to grill a basic root vegetable, we've got a problem. Chances are pretty good the root vegetable should be a regular part of my repertoire. I should know it backward and forward. It's veggie muscle memory. It's delicious. It's simple. So no, this is not a post about a rolled flank steak with 4 cheese, 3 meats, and a dash of saffron grilled over guava wood plucked from the perch of an unladen African swallow. It's about the carrot. Nothing more, nothing less. Simple. Orange. Good. Wait. All this talk of simplicity and I include a glaze? Well, yes. After all, your comforter is only as good as your bed. 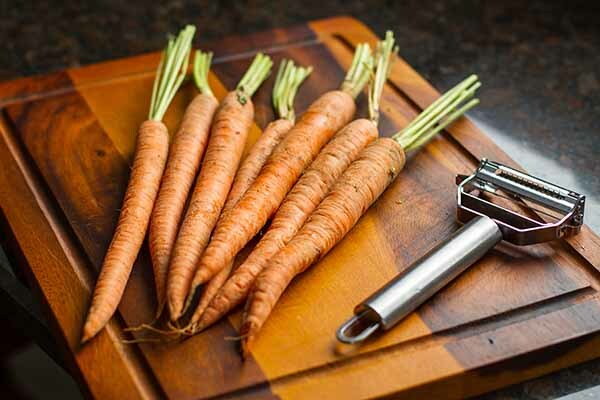 Unpeeled carrots are perfectly edible if cleaned. However, I like to either scrape the bitter skin off with a sharp knife or a peeler. I like to parboil my carrots. Yes, I understand this is not grilling, but it speeds along the cooking process and in the end, makes for a great carrot. A carrot is dense, and while it can be completely grilled, a carrot that has just the right texture and bite needs some pre-cooking before it hits the grate. 1. Prepare the grill for direct cooking over medium heat (350° to 450° F). 2. Place the carrots in a large pot of boiling water. Cook for 5 minutes. Remove from the water and rinse under cold water to stop the cooking. 3. In a small saucepan, melt the butter. Stir in the honey and cinnamon. 4. Grill the carrots over direct medium heat for 6 minutes, rotating at least twice. Brush with the melted butter sauce during the last 3 minutes. 5. Remove from the grill and serve.